Austria has a long tradition when it comes to music, particularly Classical and Yodelling. 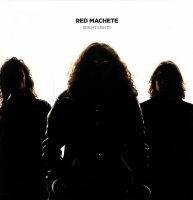 Fortunately for us, Red Machete are a power trio from Linz, Austria, that feature neither of these musical elements. Instead, they neatly combine the Classic Rock of the seventies (rhythm section) with the Hair Metal of the eighties (guitars and vocals). 'Bright Lights' is the band's first full-length album following on from their 2013 five track EP 'Electric Power'. Chris Hannah (bass), Klaus Fischer (drums) and Marco Hadzic (guitars & vocals) have certainly upped the ante with this release. Opener 'Hungry' is reminiscent of the infectious sound purveyed by new bands Station and Tempt who are striving to keep this style of music alive and kicking. 'Never Stop' snarls with a Hard Rockin' Blues backbeat whilst 'All For You' has that old-school AC/DC vibe and features the huge backing vocals that are characteristic throughout this album. The foot-tapping 'One More Chance' continues the theme, but with a more eighties than seventies feel which is built around a monster chorus. The contagious, angst-driven, 'Ninety-Nine And One' would have been all over MTV back in the late eighties with its memorable chorus; it brings to mind Dutch Glam Metal band Sleeze Beez. The album continues with the high-octane vocals and scorching guitars of 'Feeding The Flame'. 'Give It All Up' has a Black Star Riders vibe whilst 'Here & Now' and 'Bad Love' are catchier than a dose of the clap in the back streets of Soho! 'Rock The Show' brings the album to a fast and furious climax. This self-produced album has a cracking sound that has been expertly mixed by Sascha Paeth (Avantasia, Edguy) and mastered by Michael Rodenberg (Avantasia, Kamelot). This facet is a cut above most independent debut releases. RM wanted to get the energy of their live shows onto the album and they have done better than most in that respect; 'Bright Lights' sounds vibrant without being too raw. Red Machete might not be offering anything original, but they have certainly shone on 'Bright Lights'. It is a well-produced and superbly executed album.